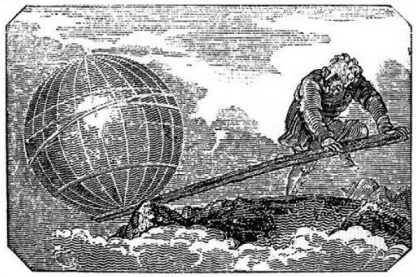 Archimedes is believed to have said, "Give me a place to stand, and I will move the Earth." He wasn't too far from the truth. We move our individual "worlds" every day through the power of leverage--that is, utilizing resources to maximize results. It might be easier than you think. Think about it: Have you Googled something recently? Then the search engine was a fulcrum for skipping tedious research via more archaic methods. Thus, you've leveraged its abilities to work in your favor. Now give yourself a little pat on the back. If you do not make time, you will never have time. Obviously no one can go out and manufacture time, although that would be a great premise for a story. And proper leverage is about more than just saving time. It is about using ingenuity in order to obtain what may otherwise be unobtainable. Or, to paraphrase Archimedes, it's about moving the world simply by knowing where to plant your feet. Before deciding to throw off the shackles of corporate America and pursue your goal to be a writer, your life was aligned with its pursuits. That is, you had a schedule, maybe an office or workspace, people who held you accountable, and certain rules and regulations you had to follow. Now consider what would happen if you were a full-time writer. Would you be at home all day, or would you go somewhere to write? Coffee shops are noisier than you might realize until you're sitting in one trying to write over the din. If you're home, how will you handle things like chores, interruptions, lunch breaks, and appointments? It isn't always easy to focus on your words when there's a big pile of laundry staring at you from across the room. And you thought you were OCD before! How will you go about setting measurable, realistic goals, and then hold yourself accountable for reaching them? I don't know many writers who are lazy, per se, but I know plenty of self-employed types who love to procrastinate. What kind of budget will you set for self-education opportunities, purchasing new technology, or traveling to writer's conferences and events? Believe it or not, it takes more than just a good idea and a laptop to make a writer. Sometimes it means broadening our horizons, or integrating new tools into our routine. All of these things can become motivational vampires, draining you of energy and time. So be prepared to confront them, confront anything, that becomes an obstacle to realizing your dream. But do it smart. With a little brainstorming, you just might find out it's easier than you think to overcome your hurdles. OK, So You Want Some Examples? If you're like me and have the goal of becoming a full-time author, you probably have some ideas as to how you can make that happen. Excellent! Please comment below and share, as I'd love to hear them. In the meantime, here are some of the things I've done to leverage my resources in pursuit of that goal. Leverage Money - A slumping economy doesn't mean you can't afford to think of new ways to budget. If your old job had you spending $100 a week on gas commuting to work, you now have $100 a week to spend on paying other people to do stuff you hate. Before you jump in with, "But, if I wasn't working..." consider this: the average commute is 45 minutes each way. That's 33 hours of reclaimed time a month! With the time you save--not to mention all the chaos and stress you avoid--you can pursue freelance writing jobs that pay you 10x that. Personally, I hired a housekeeper. For $60 she cleans my entire home once a week. It is a huge emotional relief. Not having to do it myself lets me focus on generating new business, or working on my writing projects. It's an investment that pays dividends. Leverage Accountability - People thrive when they're held accountable for reaching certain goals and milestones. If you don't empower someone in your life to tell you when you're failing, it can start to feel like you just stepped into Lord of the Flies. It's chaos. So join a good critique group. Communicate regularly with other writers. Sure, your spouse may be confused about this new pursuit of yours, but let he or she know you have aspirations and you need help achieving them. Or, if you're progressing nicely in your writing and you feel the time is right, consider signing up with a literary agent. Leveraging this support network of friends and colleagues might reveal your harshest critics, but you may also discover your strongest advocates. Leverage Connections - Whenever I'm looking to start a new project, I often think about who in my personal "sphere" might have skills, resources or knowledge I can leverage to make it happen. Provided you're not obnoxious about it, this works amazingly well. If you want to write, make it known. Ask friends if their company ever hires freelancers. Talk to your old college English professor and see if he or she knows of any local media outlets looking for talent. (Note: It helps if you were actually a good student.) Don't just haphazardly put it out there and expect a favorable response, but actively think about who you know and what they do. Chances are everyone knows someone who could use a good writer. Leverage Trade - For my part, I can be pretty fierce with a red pen. Friends and colleagues often ask me to re-tool their résumés, edit proposals, and tweak their profiles for social networking sites like LinkedIn and Facebook. Many times I'll do it for free. Why? It's not because I'm being overly altruistic. It's because I know that eventually I'll need a favor in return. This coincides nicely with leveraging connections, too. Let's say you approach a local non-profit and offer to write some of their .org web content gratis, but with the understanding that you'll get paid if you write the copy for the brochure promoting their upcoming food drive. Or talk to your dentist and trade some teeth cleanings in exchange for writing his professional bio. If you're pleasant, and do a good job, those people will talk, and word-of-mouth promotion from raving fans is the best kind of leverage out there! I hope you've enjoyed the second installment of my 5 Small Steps series, helping those who want to pursue writing as a career. It is possible! Find the right place to stand, and you too can move the Earth! Good tips on leveraging. People tend to make time for what's important - most simply don't realize that the reason they have no time is that it's just not important enough to them. And I have no plans to become an author full-time.